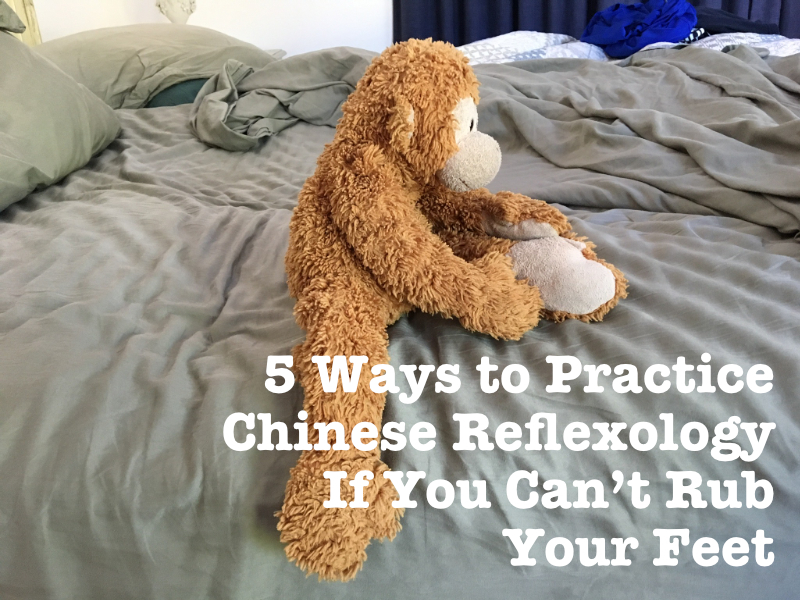 One of the questions I get asked regularly is, “How do you practice Chinese Reflexology if you can’t rub your feet?” Sometimes a structural issue or injury makes it hard to massage your feet. Other times, it’s simply not convenient. Imagine whipping off your shoes and rubbing your feet in the middle of an important business meeting! For those times when you can’t reach down and rub your feet, here are 5 ways to help you practice Chinese Reflexology. In an article on My 5 Favorite Things for Feet, I wrote about the Foot Rubz. This is a hard rubber massage ball with pokey nubs all over it. In lieu of massaging your feet with your hands and fingers, you can simply place this prickly ball on the floor and roll your foot over it. This is a great alternative if you find it hard to reach your feet, it’s uncomfortable to massage with your hands, or if you’re looking for a discreet way to practice reflexology while you’re sitting at your desk at work. Simply kick off your shoes, place the ball down in front of you, and roll your foot as you’re sitting in front of the computer. Because the soles of your feet contain many of the reflexology points for the body’s primary organs, the Foot Rubz is a convenient way to get extra reflexology during the day. 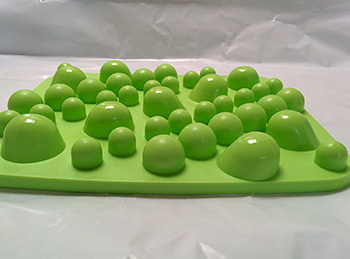 I recommend this nubby ball to students in my online programs who have trouble pressing their points with their fingers or who can’t easily reach their feet. In the programs, I give students specific instructions based on the challenges they face. But you can use the Foot Rubz by rolling your foot on it throughout the day. Try 5 to 10 seconds “here and there” over the course of the day. While it’s better to target your reflexology points as you massage, the Foot Rubz gives a good overall massage of your soles. A reflexology board (or mat) has both pros and cons. One of the pros is that it has raised nubs in different sizes that enable you to hone in on sensitive points on your feet. But one of the main cons is that it has raised nubs in different sizes that let you hone in on sensitive points on your feet. People new to reflexology may overwork their points using a reflexology board because you can apply a lot of pressure with your bodyweight. My recommendation is that if you’re new to reflexology, the mat/board should be used as a supplementary tool, not the main course. Whatever you do, DO NOT STAND ON IT WITH ALL OF YOUR WEIGHT. This is far too intense. I don’t even do that, and I’ve been practicing Chinese Reflexology for over a decade. Instead, place the mat or board on the floor in front of a chair, have a seat, and press your foot onto the board using your leg strength alone. You can also stand beside the board while holding onto a table or chair for balance. Then gradually press ONE FOOT onto the board for five seconds. Your other foot will be on the floor, not the board/mat. While you’re standing with the support of the table or chair, you can move your foot on the board to reach different spots on your sole, Use just enough pressure so that you can feel the pressure on your sole without it being uncomfortable. Did you know that many body parts are a microcosm for the whole body? For example, there’s a style of acupuncture called auricular acupuncture. This is where points on the ear correlate to different areas of the body, and can be stimulated with needles or other types of pressure. With Chinese Reflexology, the foot is a microcosm for your body—but so are your hands. 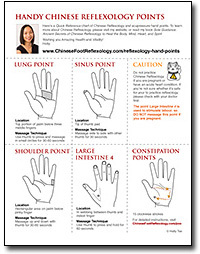 Thus, you can massage points on your hands to practice Chinese Reflexology. While the Chinese Reflexology points on your feet are more powerful for moving qi, sometimes it’s not practical or possible to massage your feet. As an alternative to the feet, you can massage your hands. Here’s an article I wrote about five of the most useful hand reflexology points. You can also sign up to get a free downloadable quick reference chart of the handiest hand points. 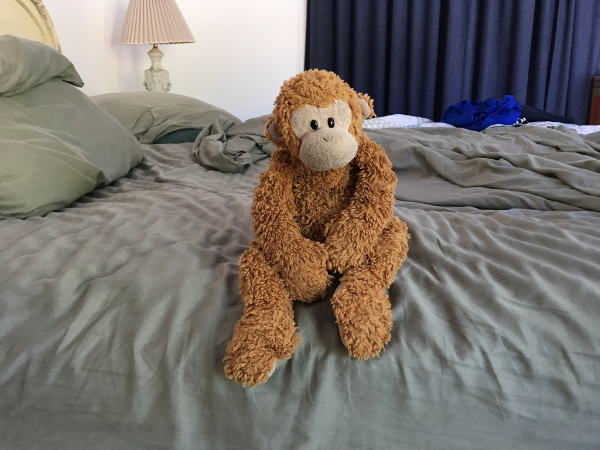 Meet Mr. Bunkey. Mr. Bunkey is wondering why he is sitting on the edge of a bed. Mr. Bunkey decides to do Chinese foot reflexology while he waits for an answer. He pulls his leg up, rests it over his other leg, and starts rubbing his kidney point. No crunchies there, Mr. Bunkey is proud to confirm. (After all, he informs me, Mr. Bunkeys don’t have kidneys!) On to the adrenals Mr. Bunkey goes. Rub, rub, rub. 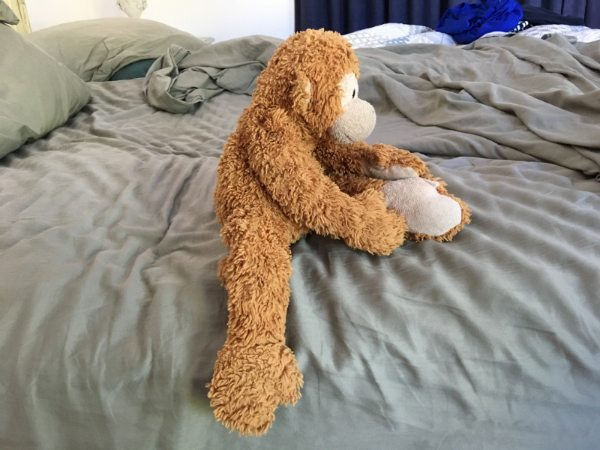 Fortunately, Mr. Bunkey is a limber monkey, so at first it’s all fun and games. Rub, rub, rub. Rubbedy, rub, rub. 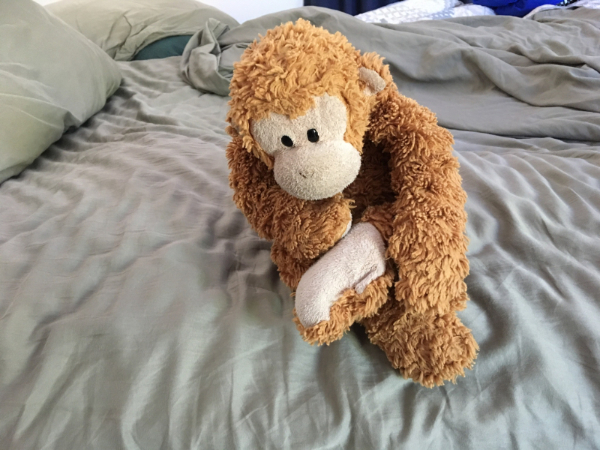 By the time Mr. Bunkey reaches his tail point, however, he has gotten very tired of holding his leg up on his lap, and his other leg is starting to resent the added weight. 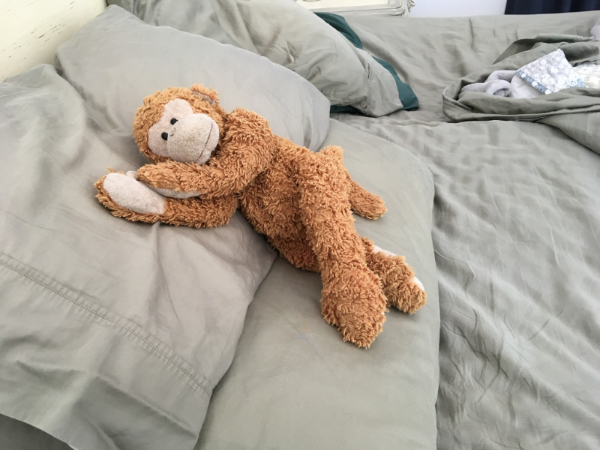 So, Mr. Bunkey decides to try a different position. Mr. Bunkey finishes up his left and right foot points and then, still not knowing why he is sitting on the edge of a bed, decides to take advantage of the situation. Mr. Bunkey is a tough act to follow, but I just so happen to have something weird and odd to pair with Mr. Bunkey’s star appeal. It’s a Snoopy-esque mutant. I love Snoopy, but I don’t know what possessed me to draw this :). If you find it hard to reach your feet, my final suggestion would be to focus on increasing your flexibility. One of the best stretches to help you gain the flexibility to massage your feet is the butterfly stretch. Here is “Snoopy” demonstrating the stretch. 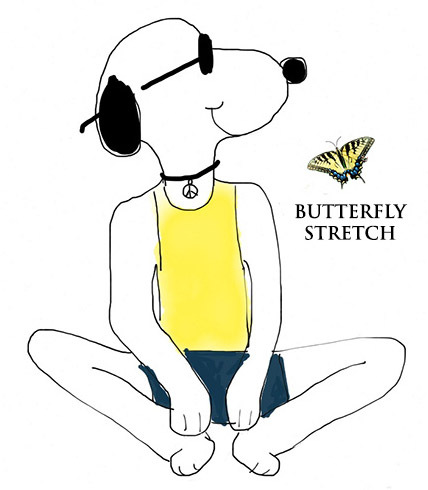 The butterfly stretch is similar to sitting cross-legged. Simply sit down on the floor and bring the soles of your feet together as you bend your knees. Try to pull your feet as close to you as possible. For a deeper stretch, hold your feet with your hands as you lean forward. It does take time to increase the flexibility in your hip flexors, but with consistent practice, this stretch will help you become more flexible and make it easier for you to reach your feet. I would recommend stretching daily and holding the position for a minimum of 30 seconds. Regardless of your situation or circumstances, I hope you’re able to practice Chinese Reflexology regularly. As I often say, “Some reflexology is better than no reflexology.” And since people often ask me which points they should massage for the best results, I’d recommend looking into my book, Sole Guidance, and also checking out my online programs. The six-week Sole Fundamentals program begins this spring, and I teach the six-month Sole Mastery program in the fall. Learn more about the online programs here.